How to Get Free Skype Unlimited International Calls | Free Pc to Phone Calls, Free Voip Calls to India International ! Skype is a well known voip provider. It is seen that whenever people are introduced to the world of voip and cheap calling (both voice and video), first thing they try out is Skype. Time to time it brings such lucrative offers which are really very hard to resist. 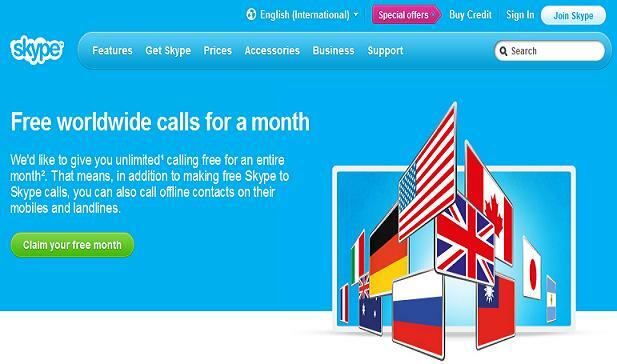 Good news is that Skype is back again with such an offer, giving you FREE Unlimited Calling for an entire month. Skype to Skype calls are already free, so if you and your friend are already using Skype then you both can talk/video chat/message to each other for free (provided you both are online on Skype client). But what about making calls to those offline contacts on their mobile or landline phones. Skype normally charges for those calls. But with this new Skype offer you can even make calls (rather unlimited calls) to these mobiles and landlines for free and that too for entire one month. Things are not to so straight forward in life and this one month unlimited world subscription plan by Skype has its own conditions. Lets find out both pros and cons of this plan. (I am talking about features of this plan and its associated terms and conditions). - One month of free unlimited calls which are worth 10.49 euros. - Calls to mobiles in seven countries including Canada, Guam, Hong Kong S.A.R. China, Puerto Rico, Singapore, Thailand and United States. - You can cancel the plan anytime you want. - Trial must be redeemed by 15/11/2012. Offer available only to existing Skype users who have been registered with Skype more than 29 days. - To qualify for the offer, you must provide valid payment details (they will charge $1 for checking account purposes). So you require a credit card here. - After the first month, your subscription will automatically continue and payments will be taken monthly unless you cancel within 27 days of the start date. Only one free Unlimited World subscription can be claimed per customer. - Excludes special, premium and non-geographic numbers. The best part about Skype is that they have application (client) for almost all devices. If you have a smartphone (be it iPhone, Android, Blackberry, Nokia, Windows based or any other), Skype has an app for you. Even if you do not have any smartphone, then also you can use Skype on your computer.